Foxj66 - Brian Enos's Forums... Maku mozo! The 75 was designed around 9mm and the mags are sized for 9. While they work with 40 they do not give the capacity of a dedicated 40 mag. That is why the TS has separate 9 and 40 mags to get appropriate capacity with both. I also run them, but shooting CO currently. If you hit one of the links in my signature you will see how far 6 mounts go around my 34 pant size waist. Thats where they all broke normally sometime after you hit about 20k rounds. Kensight warrantied the last one I broke like that. I haven't had any issues on my automated 1050 with it but probably only have 10-15k loaded since I added one to it. I got one for my 550 first and never had a problem. Need to purchase a holster rig, any shops offer discounts? 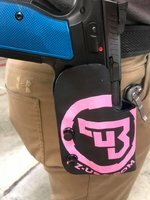 I believe shooters connection has some kind of deal where you get a $50 dollar coupon when you first join USPSA. I would do the hammers at the same time you will end up wanting them anyways as they clean up the single action. As for the sear it makes the job easier and you will need the spacer. I have put 2 RRK in from Cajun they are pretty easy to do and get good results. Also with those export times order some spare main and recoil springs for stock. 11.5 main with the extended firing pins has been 100% for me over 5 guns with CCI and S&B primers. Foxj66 replied to scgun's topic in Travel, Locations, Ranges, etc. I doubt anywhere carries them in store. I would call Scott at cajun and ask if any do. If not they ship quick and you can also get their parts from Shooters connection and Ben Stoeger pro shop both of which also have quick shipping. UPDATE I had Carpal Tunnel Release surgery on both hands the same day in the middle of January, I was back at work the following day (desk job) It was almost instant relief of the pain in hands. As for shooting I shot a little bit 3-1/2 weeks after surgery but it still bothers my weak hand a little in recoil so right now I am just do light dry fire and waiting a few more days to try shooting again. What about Radial Tunnel Syndrome? Any experience??? I haven't but all I can say is the CTS was almost instant relief of the hand pain for me, hopefully you can heal up quickly and fully as well. Not anymore if ever, All of my invites have come from winning my class at nationals or winning my division at my state match. I think I got an invite for winning my class and being second overall at a state match once as well. Doesn't really matter if you want to go to nationals you should be able to get in without an invite. Flying out of state with an SBR - ATF turnaround time? Foxj66 replied to random_guy7531's topic in Travel, Locations, Ranges, etc. Its not going to make a difference in use IMHO. As for which one to get, you want the STI one as the head will be trimmed to avoid contact with the barrel feet. I believe that's the only change.